In a few minutes we will be back for you. Our highly qualified system administrators are in the process of solving a problem or installing a new update. STEIN - How to Support US! If you want to support us so we can continue working on Stein, then simply buy something in the Ingame-Shop of Stein. This helps us a lot and we can spend more time in the development and improvement of Stein. Welcome to Stein's open alpha test. All purchases in the Ingame-Shop will remain after the alpha, also your level as well as the progression of your character. We wish you much fun with the Alpha! - New quests for level 30 epic weapons for each class. - You can now pass in the need or greed window. - Pass has the lowest priority (Need > Greed > Pass). - Passed items are also assigned by random. - Passed items drop on the ground and don't go in the inventory like Need or Greed. - Item pickup range for dropped items is now limited to 30 blocks. - Item which could not be picked up redrop at the same location. - Despawn time for dropped items increased to 3 minutes (from 1 minute). - Reduced the amount of education slots for free players to one. - Chat is now divided into Tabs. - Chat Tabs can be configured in options. - Optional Timestamps for chat messages. - Cleaned up Tooltip for items. - Zoom Buttons for Minimap (+/-). - Damage and Heal are now colored depending on source and if they are critical hits. - Critical hits are now highlighted visually through an text animation. - Player Hub is now hidden on first login/registration. - Inventory Bug where drag and drop didn't work on some third party pages (itch.io/newgrounds) is fixed through chrome update (please update this browser if it is still not working). - Added missing Zone for Bitterburg Keep entrance room. - Item amounts for quests now update correctly for traded and banked items. 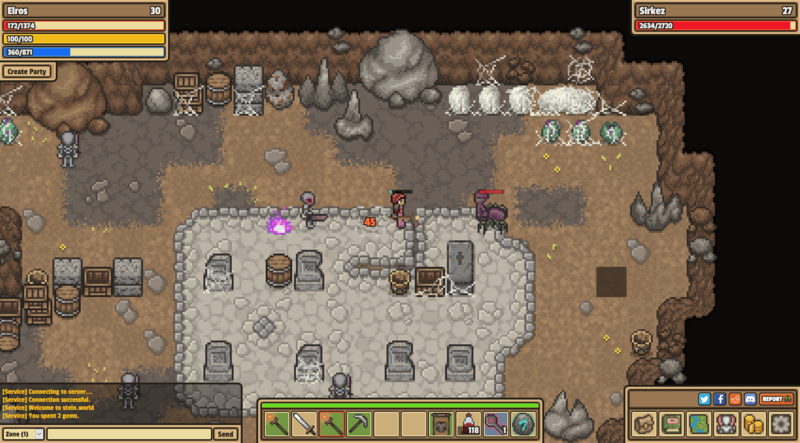 - Added Twitch Link in Player-Hub..
- Players should now leave a dungeon correctly, while they were dead on leave. - Removing items from player trade now resets the lock for both players. - Player trade now closes on player despawn. 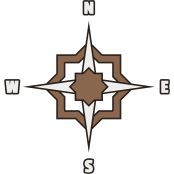 - Scrolling on map for zoom no longer scrolls embeding page. - Amount selection now closes when you close the shop. - Trash item dialog closes when you close the inventory. - Reconnect no longer duplicates entries in friendlist and gem shop. - Bank now closes when you press the close all button. - New Crafting Resource "Livisum" which can be obtained in Windsor Hold. - New Crafting Books which can be bought for "Livisum"
- New sets for each class. - 3 new weapon types per class. - New Quest which awards one backpack slot. - Bank: In Waldenbach the first bank opened its doors for business. - Provides initially 10 slots of storage. - Storage can be extended by 10 slots up to 3 times for gold (for 100.000 Gold, 1.000.000 Gold, 10.000.000 Gold). - Storage can be extended by 10 slots unlimited for 100 gems. - Bank storage will be shared between all (future) banks. 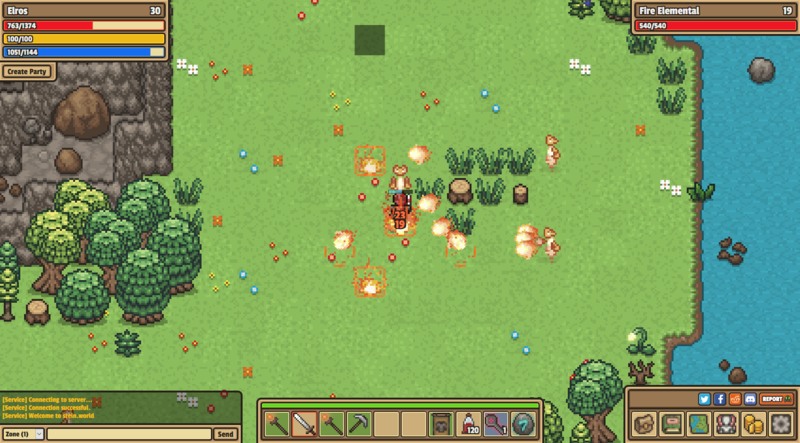 - New visual effects for weapons. - Keys for dungeons and wave dungeons where removed from the gem shop. - Replaced the Strong Potions with the Lavekawa Potions in the gem shop. - Hit chance reduction will now start when the item is more than 3 levels below your own level. - The current zone is now always displayed when you enter a subzone. - Gold prices at traders are now color-coded correctly and display the gold icon. - Item "Fortuity" now has the correct level requirement of level 29 (before patch: level 26). - Item "Consecration" now has the correct amount of affinity points of 1 (before patch: 2 points). - Trashing your selected weapons now updates your character appearance. - Fast attacks no longer skip animations. - Fixed a bug where Decorations could be placed multiple times. - Fixed a bug for mobile devices which caused a black or a scrambled display of the game world. - Fixed resource loading which caused a mixed mode warning in browsers. - Weapons now need "Points" to get activated. - Armor can have "Points" which are required for those weapons. - Example: Weapon need two "Holy Points" to be able to be used -> You have to equip Armor so that you have at least two of those Points equipped. - Base Critical Chance reduced from 1% to 0%. - Cooldown on items got converted from percentage to a rating system. - Critical chance on items got converted from percentage to a rating system. - Critical damage on items got converted from percentage to a rating system. - You can buy themed decoration crates, which give you one random decoration you can place in the world for a few minutes. 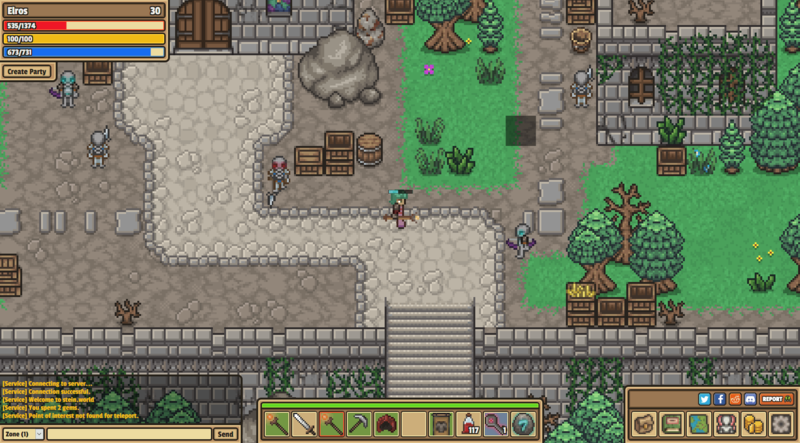 - Enemies and Questgivers now have a idle animation. 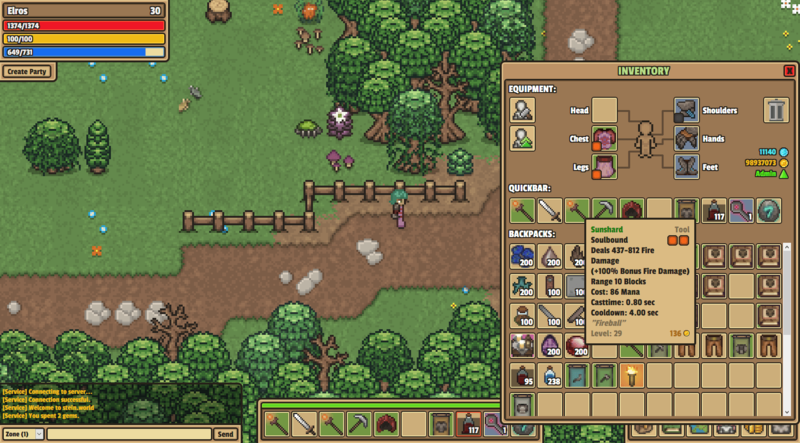 - Level Requirement is now always displayed for Tools and Consumables. - Target Marker updates now without mouse movement. - Cooldown is now displayed correctly in Tooltip so its always at least the casttime. - Cooldown is now visible in the Inventory. - Casttime is now visible on all items in the quickbar if you activate a item. 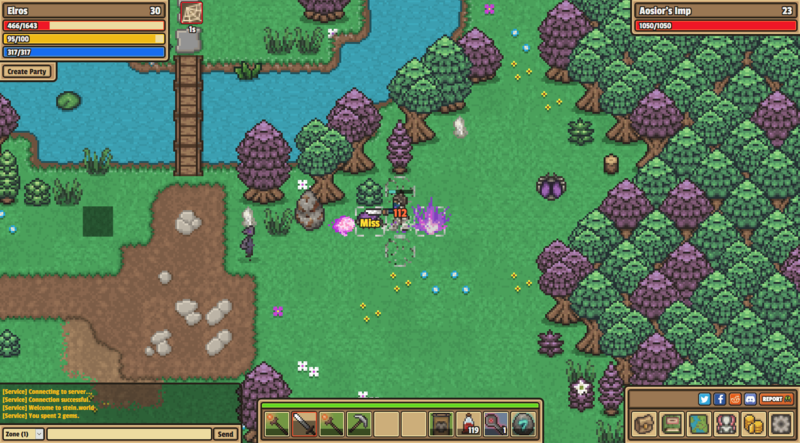 - Gathered entities in the world now have a despawn animation. - Questgivers now display a gray exclamation mark over there head if they have a quest for which you are to low or you have not finished jet. You can Also see those quests in the Dialog with the Questgiver now. - Use item is now assignable to a keyboard key in the options (Default: no assignment). - Quest rewards are now displayed before you explicitly finish a quest. - Buy all option was removed. - Trashing a item now needs you to confirm that you really want to trash it. - Buffs for player and target now show remaining time and are sorted accordingly. - Crafted Shoulders of Bloodlust now need 3 Forslurite instead of 3 Torn Leather. - Fixed a bug where items could not be picked due to UI overlaps. 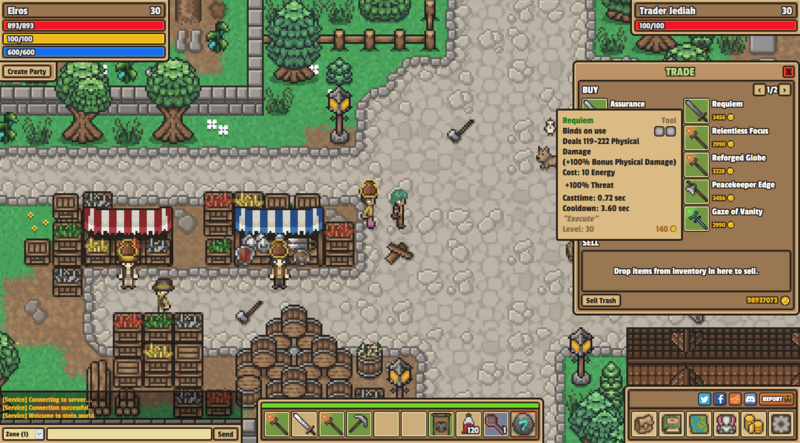 - Added Trading between players. - You can open interaction options with players by pressing "E" (Interact Keybinding). - Player Interaction contain option to Trade with player. - Trade with Player opens Player Trading Window. - Trade with Player is canceled by movement, receiving damage, activating items and the cancel button in the Window. - You can select an amount of gold to trade with. - You can drag and drop items into the trade window to offer them. - Both players have to accept the trade to execute it. - Accept state is reset when someone changes the traded content. 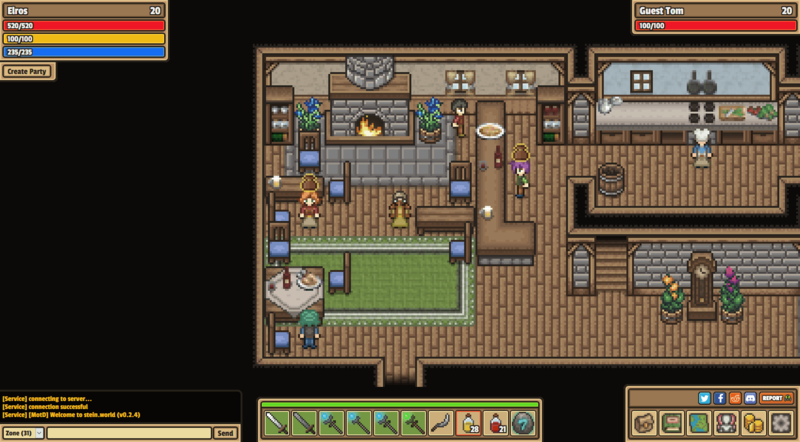 - Added the lower tier gather items as resource to the gather item recipes. - Added keybinding option for profession window hotkey. - Chat Command "/help" is now available to display all available Commands. - Chat Command "/played" is now available to display your total time in the game. - Amount selection now gets focus when its opened. - removed not available Alchemy from Rankings and Profession Window. - Oscar Bretscher no longer drops profession items. - Fixed spelling of "Gobal" to "Global" in options window. - Amount selection now gets closed correctly when "Close All" button is. - You no longer trigger other actions while writing in the amount selection input. - Added worldboss "Catarina Scarletwound"
- The timer for "Need or Greed" has been increased from 30 sec. to 90 sec. - You can now Toggle through Chat Types with "TAB" and "SHIFT+TAB"
- While in a group you no longer receive other items as are displayed in the wave dungeon reward screen. - Fixed a bug through which you could die while the wave in the wave dungeon has already ended. - Added Reconnect Button after "connection closed"
- Added Shop for "Dinko Matenda"
- Added new payment method "PayPal"
- Added possibility to close windows with "ESC"
- Added Wave Dungeon "Cygluln Chamber"
You have to help us get bigger, because without you we can not do that. Support us! Every rating, like, share, follow or upvote helps us a lot. Did you know that you can play stein.world via a client? Download it today from itch.io and enjoy stein.world in all its glory. Get a full account today! Stein.world is free to play, and everyone is welcome to play free as long as he wants. However, if you enjoy stein.world, you may consider an upgrade to a full account. With a full Account you have many additions that make your life easier and better in stein.world! If you want to actively support us in the development of Stein, then just buy something in the shop. This supports us the most, since your donation comes directly and without detours to us. And in addition you also get something for your money. Thank you for your support and we wish you a lot of fun in Stein! Serezith has occupied Bitterburg Keep. It is now up to you to defeat him and free Waldenbach from his tyranny. You can control your character with "WASD" or the arrow keys through the world. If you're playing on a mobile device, just swipe in the direction you want to go. An exclamation mark above an NPC means that he has a quest for you. YELLOW: He has a new quest for you. GRAY: You have an unfinished quest for the NPC. GREEN: You have a finished quest and can pick up your reward. Stand directly in front of the person or object you want to interact with and press "E". As a mobile user, stand directly in front of the person or object and long tap on the screen. To attack enemies, you need to select a weapon in your Quickbar. If you have selected one you can attack opponents with the left mouse button. On mobile devices, you have to tap on the enemy. You finished Wave 0 of Dungeon. With proceeding by clicking on "Buy now" you accept the Terms of Service and give consent that pg5-Studio begins immediately with the execution of the service, by which you lose your Right of withdrawal. Required Level: 1 5 Sec. You can store items from your inventory in the bank, by drag and dropping them over. The banks content is shared between all banks in the world. So you can access your items from any other bank. Drop items from inventory in here to sell. Are you sure you want to halve the remaining learn time for "Skillbook Name"? This will cost 00 and the Gems will not be refunded if you cancel the learning process.